Editing on the new Mug and Meralda book, Every Wind of Change, is ongoing. I do hope to get the book out soon (as in weeks not months). Covers are also being designed. Which leads me to a question -- is there an inherent preference among readers for photographic images of cover models versus digitally-created models? There are advantages to using digital people as cover models. You can choose your model's hair color, body shape, and facial features, for instance. You can pose them as you wish, dress them in costumes appropriate for the setting, even recreate a scene from the book, if you have the time, the skills, and the computer hardware capable of rendering the image. You can do all that with a live model too, but the costs will be astronomical. Most indie book covers are composed of stock photography images which are retouched and layered. You can buy a perfectly legal stock images for around 20 bucks each, and that grants you the rights to use the images in your cover. Of course the problem is finding a model who resembles your character and is clothed in the appropriate garments. Getting the right pose is also a challenge. Be prepared to scroll through hundreds if not thousands of images to find something remotely close to the look you want. I want Meralda on the cover. She needs to have an air of confidence about her. She needs to be dressed in Edwardian or Victorian styled clothing, although they need not be period-accurate since the setting is neither on Earth nor in that period. She does NOT need to be wearing a miniskirt and seven-inch heels. Or a tube top. That immediately eliminates thousands of stock photo images. The same problem resides in finding clothing for digital models. Even the steampunk outfits tend to be far too revealing for my characters. I mean come on -- female airship pirates in thigh-high heeled boots and skirts so short they might as well be belts? I was 14 once too, but sheesh. You'd freeze to death at higher altitudes in that outfit. And don't even get me started on most fantasy female armor. "Hey, this woman needs protective battle gear. So let's leave her legs and midriff exposed. Put some form-fitting steel around her breasts, but use as little metal as possible, and make sure there's plenty of exposed cleavage. Yeah. We've left all her vital organs vulnerable, and made sure she can't run or dodge. Time to battle the forces of evil!" Meralda would never wear such a stupid outfit. But, with time and effort, you can find clothes, either digital or live, that will more or less suit your needs. Poses are another matter. My digital Meralda can be posed into any position -- but not quickly or easily. Digital people in the system I've used (DAZ 3D) have an internal skeleton. You pose them by moving through the drop-down menu of bones. Each bone is adjusted individually, in sequence (chest to shoulder to upper arm to elbow to forearm to hand to fingers, etc.). Getting someone to sit in a chair properly might take hours, unless you buy a chair-sitting pose. And even then you'll need to tweak that. And buy the chair. With live models, you're limited to what you can find. Most of the poses tend to be generic, because the demand for 'model running forward while brandishing a fantasy lightning gun' is low. All that aside, there's the matter of image quality and detail. Photos of live models look realistic because they depict a real person. Images of digital models can approach photorealism, but only if your source models contain the complexity and your hardware can handle the intensive process of rendering so much light data. I think this took around six hours. That's not six hours to complete from start to finish -- that's six hours from the time I finished the posing, the background, and the lighting, decided the low-resolution image was worth rendering, and hit the RENDER button. I wasn't even running on high settings. I have no idea how long a high-resolution image would have taken. I like the finished image. So, just as a test, I extracted Meralda from that picture, and used her as the model in a test cover image. I'm hesitant to actually use the digital model, though. I know authors who tried that, and received lots of negative feedback. So let me ask you, right here. I'm going to post two images -- one a mock-up of a cover with a photo model, and the other a mock-up of a cover with a digital model. I'd appreciate any comments you might have. Which cover concept do you prefer? Would seeing the digital Meralda make you less likely to buy the book? Keep in mind neither of these images is truly finished. I'm just testing a theory here. Any input would be appreciated. I spend far too much time scrolling through cover images on Amazon and elsewhere. Say what you will about gatekeepers and the evils of Big Publishing, but with a few notable exceptions, they usually produce decent covers. Inclusion of dubious 'reader awards' and breathless claims to best-seller status. Here's one I threw together, using my own title, as an example of what NEVER to do (the image is from an old pulp magazine cover, long since passed into the public domain). Airborne snapping turtles are never a good idea. 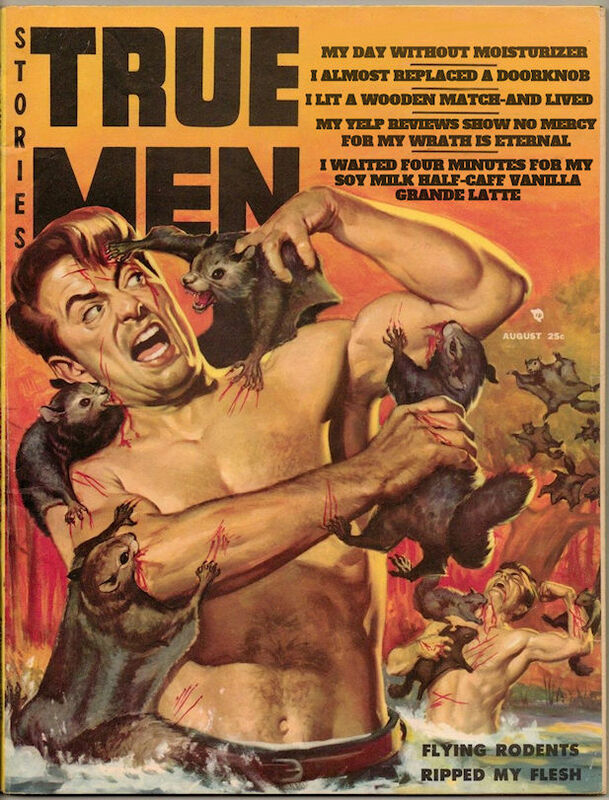 Here's another old pulp I 'improved,' included just for fun. And another, because as I stated previously, I'm editing and editing is work so why not play with my graphics program? Many years ago, my grandmother opened a cabinet and a flying squirrel leaped out and landed in the bowl of mashed potatoes on the dinner table. The flying squirrel neither maimed nor ripped anyone, although it did lick its little paws appreciatively while it dined. Hope you enjoyed the revised pulp covers. If you have a moment, please leave a comment about digital versus photographic Meralda in the comments, or email me at franktuttle at franktuttle dot com. Time to get back to work. Have a good week, everyone!